Playa - Hip Hop Virtual Instrument, Other Virtual Intrument from SONiVOX MI. SONiVOX has announced the imminent release of Playa – Hip Hop Virtual Instrument, a new virtual instrument plug-in for Mac OS X and Windows. Playa is designed for quick and easy sequencing, beat construction, and hands-on remixing. 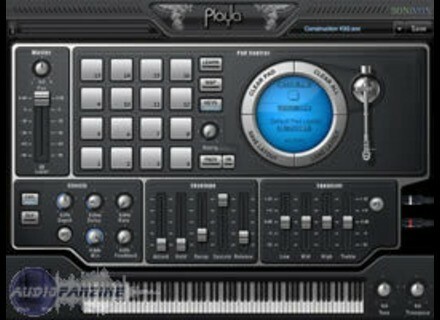 Playa's user interface is designed to bridge the gap between MPC style beat creation and the computer based virtual instrument environment. 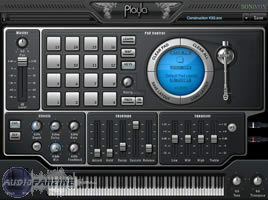 Playa allows users to interface their MIDI pad controllers and controller keyboards directly with the software. 400+ SONiVOX Instruments – Fat synths, basses, drums, leads, orchestral instruments, ethnic instruments, guitars, strings, brass and more. 16 User Programmable and Assignable Pads – For MPC style beat construction. Over 50 Pad Presets – Various construction kit layouts, diatonic chord mappings, arpeggios, chord progressions and motifs. Playa will be available February 1st, 2009, with an MSRP of $149 and an introductory street price of $99. It will be available for Windows (Standalone, VST and RTAS) and Mac OS X (Standalone, AU, VST, and RTAS). New Apogee Electronics Duet Software Apogee Electronics is has announced the release of new Duet software and User's Guide, now available on the Apogee website. EZmYx and AuToBaSsYx Updates Tekky Synths has updated eZmYx to v1.2.k and AuToBaSsYx to v1.2. AZ Audio Presents: ADopplerEn2 AZ Audio has announced the release of ADopplerEn2, a reworking of the original AdopplerEn VST effect for Windows VST Hosts.